Protesters claim police use violence and tear gas in clearing them from junction; girl arrested among 250 protesting at Jerusalem entrance. No less than 18 protesters have been arrested at Hatishbi Junction in the Jezreel Valley in the north, as they demonstrated Tuesday night against how the Israeli Security Agency (ISA) has been allegedly torturing Jews held in connection with the lethal Duma arson. Another three were arrested protesting in Jerusalem. Dozens of protesters took part in the demonstration, and claimed that the police used violence against them including spraying tear gas at them, before the officers finally cleared all the protesters at around 9 p.m. Video from the incident can be viewed by clicking the image below. Police issued a statement saying that a handful of youths arrived at Hatishbi Junction and tried to physically block the traffic. Police forces arrived and demanded that they clear the road due to the potential dangers. According to police, the youths refused at which point the officers began evacuating them, arresting 18 in the process on suspicions of public disorder. "Israel Police will allow the protesting public to take advantage of their democratic rights and express protest. The police allow freedom of speech and protest under the conditions of respecting the law, and conditions that do not harm the routine and public order. Any attempt to breach the order will receive a hard hand and zero tolerance," said the police. The protest took place at the same time as a large demonstration at Jerusalem's iconic Chords Bridge, where at least 250 people protested the Duma investigation and the torture. The Honenu legal aid organization reported that an 18-year-old girl was arrested by police during the protest at the entrance to Jerusalem, and later added that another two protesters were arrested for allegedly breaching the public order. 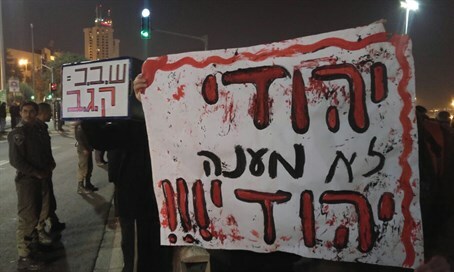 Tuesday night's protests came after attorney Itamar Ben-Gvir earlier in the day accused the ISA of sexually abusing his minor client during the course of the interrogation, amid a string of already-damning evidence of torture mounting against the intelligence body. While psychologists and social workers issued a petition to stop the torture they argue is illegal under Israeli law, and likewise civil rights groups have called to investigate the ISA over the torture, a string of politicians gave their full support to the ISA on Tuesday, including Prime Minister Binyamin Netanyahu, Jewish Home chairperson Naftali Bennett, Justice Minister Ayelet Shaked (Jewish Home), and Defense Minister Moshe Ya'alon (Likud). Ya'alon, as well as Internal Security Minister Gilad Erdan (Likud), have previously admitted there is no evidence against the suspects. Damning audio evidence released earlier this week during a court hearing revealed one suspect testifying that he attempted suicide and begged for the ISA to kill him because he could not bear the torture any longer. The suspect's arms were found to be covered in numerous scars, providing further backing to his statements.